to Kamehameha Iki Park near the Banyan Tree in Old Lahaina Town. 26.2 miles of whales, beautiful oceanfront and mountain vistas. 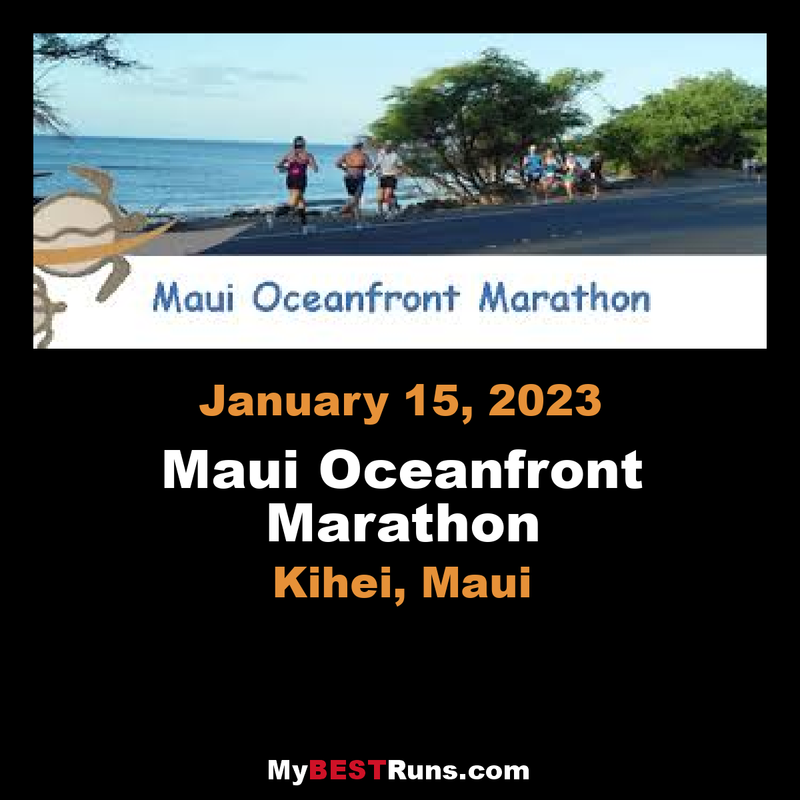 As its name suggests, the Maui Oceanfront Marathon, Half Marathon, 15K Run & 5K gives runners the chance to run along the oceanside highways of the windswept western coast of Maui, one of Hawaii’s most popular travel and beach resort destinations. Fast and mostly flat throughout, with a few rolling hills along the 6.5-mile out-and-back course that those running the half cover twice, the half marathon is run at sea level, with views of whales and surfers on the waves out in the ocean just off the coast of Maui. 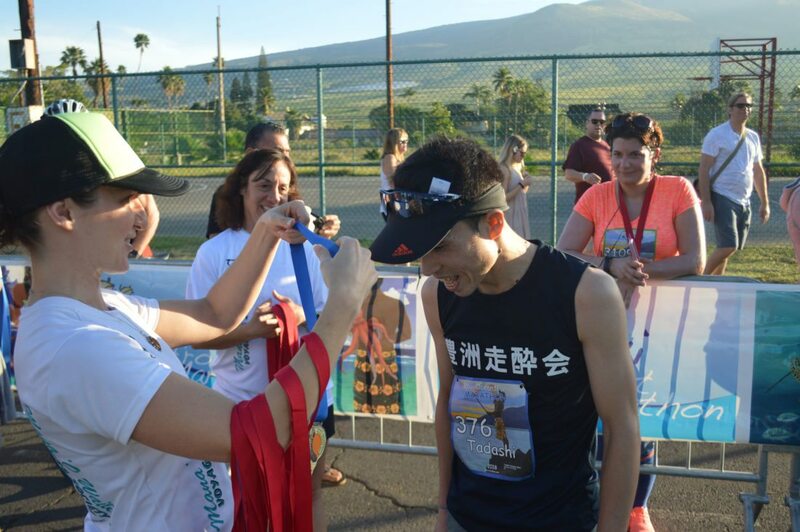 Though the full marathon starts in Wailea, the half marathon starts and finishes on Front Street in Lahaina, at the finish line where those running the full marathon complete their 26.2 miles. The 13.1-mile course for the half takes runners from Lahaina southeastward along the beachfront, along Front Street and Honoapiilania Highway, down to the turnaround point just past Olowalu and Kailiili Beach. Along the way, the Hawaii oceanfront scenery is truly breathtaking, as runners trek along palm-tree-lined highways with the green, forested West Maui Mountains off in the distance. Runners also pass by some of Maui’s most beautiful beaches along the race route, as the course passes twice each through Puamana Beach Park, Launiopoko State Park and Awalua Beach, once on the way out to the half-way turnaround and again on the way back toward the finish line in Lahaina. While the 15K and the half marathon are open to runners only, walkers are welcome in both the full marathon race and the 5K. The Maui Oceanfront Marathon is community event benefiting local school teams, clubs, and Maui non-profit groups that help put on the Marathon.The course has many scenic pull outs and public beaches.The Marathon runs north from Wailea through Kihei and along some of the prettiest beaches in the world and ends in Old Lahaina Town.Run with 10,000 Haleakala Volcano and the green West Maui Mountains on your right side. Watch out for rainbows!! and January is the coolest and best running month in Hawaii. The course starts on Wailea Alanui Drive near the Shops of Wailea and the Marriott Hotel heading north and then down onto South Kihei Road, through oceanfront Kihei Town with a left turn onto Highway 30 at the 11 mile mark above Maalaea Bay and continues oceanfront all the way to Front Street at the South end of Old Lahaina Town. The last mile is through oceanfront residential and ends at oceanfront Kamehameha Iki Park at 525 Front Stree. 1. The start of the Marathon is in the Shops of Wailea Parking lot. 2. The course travels north from the Shops of Wailea on Wailea Alanui Drive and then down to South Kihei Rd at mile 1, through oceanfront Kihei Town with a left turn ontoHighway 30 at 11 miles near Ma'alaea Bay and continues oceanfront all the way to Front Street at the South end of Old Lahaina Town. 4. The last mile is through oceanfront residential and ends at oceanfront Kamehameha Iki Park adjacent to 505 Front Street. 5. All of the course is on asphalt and the shoulder of the road. The shoulder is mostly between 4 and 6' wide. 6. The course has many scenic pull outs and public beaches for family and friends to park, picnic and support your run.